Just what I wanted. Has that "Spa" look. Upgrade your bedding with this set of two Euro shams. 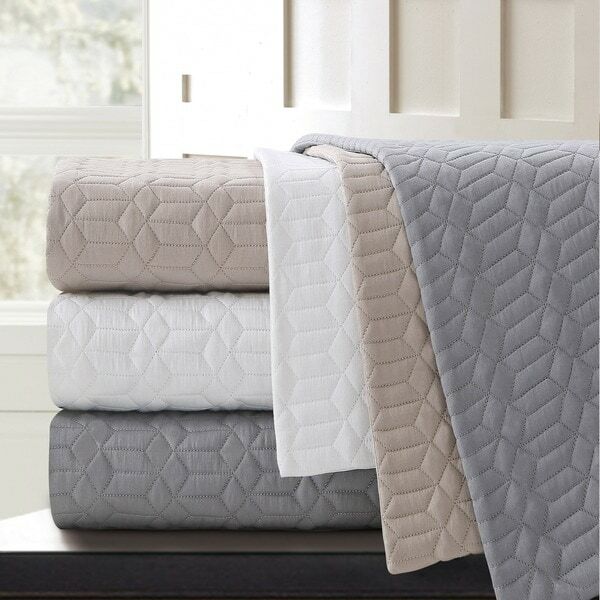 Showcasing an understated pattern and quilted design, these shams bring subtle beauty to your pillows. Clean edges and a tailored look give this set upscale beauty. Available in your choice of colors, these shams coordinate seamlessly with a range of bedding styles. Given that these are two Euro shams for less than $$, I would say the quality is as expected. The photo made the sham look quite sleek and tailored, but in reality it is just plain quilted cotton. The back is not quilted (as stated in the description also) but is very, very thin. You can pretty much see through it. Not an issue for me, as the shams just sit at the back of my bed, but if you are looking for a higher end product this may not be the item for you. When I bought the items, I had in mind to use them for my European pillows to sleep on. While these Euro Shams are too stiff for this in my opinion and probably were not meant to be used like that, I do like the way they look. They are perfect for my deco pillows on the bed and look very nice. The quality could be a tad better but I think that for a set of two, considering the price, I cannot really complain. The pattern on the front of the Euro Sham is quite attractive and nicely done. I am considering buying another set in a different color and would recommend these to friends. Gray is a little darker than my monitor but it is a nice fabric with a slight sheen. It dresses the look up which is what I wanted without being shiny. 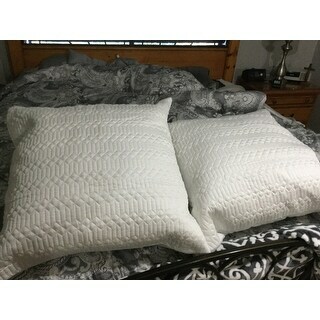 The 26 inch Euro sham pillows fit well and fill out the sham. There are no edges which makes for a nice clean look without the floppy edges you see with a lot of shams. Hidden zipper closing is added benefit. Love that somebody sells the euro sham SET OF TWO with coordinating quilt! I needed a different texture to coordinate with my ******* **** bedding and this was perfect. I loved how this came in lots of texture choices, too! I bought a set of these in white and was pleasantly surprised. In addition to the classy design texture, these Euro shams have a slight sheen to them, which is a nice touch. They are soft and will fit an oversized 29"x29" Euro pillow. Looks & feels amazing! 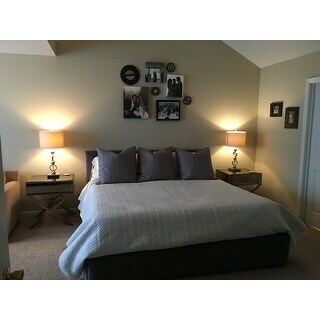 Combined white bedspread with grey shams. Love it! The euro sham covers are of excellent quality. The color is beautiful. I would recommend them to others. Although this isn't the nicest quality euro sham out there, it looks terrific on the bed. A couple of things to note: If you need to take the pillow out repeatedly, you will get frustrated with the low-quality zipper. Also, the back of the sham is a plain white cotton (not thick like the front) and has no pattern. Therefore, you can't really flip the sham over if it get's dirty. Nevertheless, I really like these for the price! Beautiful shams and nice quality. Been looking for white euro shams , but found them so expensive ! Found this beautiful ones in a pair and a fantastic , fantastic price , so pretty fabric and soft texture fabric . Great deal and exactly what I wanted. I bought the shams in the grey color to compliment my glam style bedding. The material is firm but not too rough. The color is true to the picture and I like how they look in my bed. Great quality. I bought the grey color and its a true grey, not a blue grey. I’ve washed them a few times and they are still perfect. Beautiful paired with the Belgian Linen duvet! "what are the demenions of this quilt"
The quilted shams are 26 x 26. "what are the dementions of this uilt???" The Euro shams are 26 x 26. 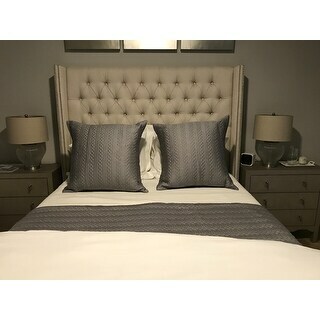 "I had previously ordered a set of the grey euro shams. I want to purchase an additional set but the grey is no longer an option. Will more come in stock?" Unfortunately, we do not have an estimated restock date set. "TEM# 17117569 , do you have any discount if order more than 60 ?" Hello ucii, for additional discount information, you can contact Customer Care at 1-800-The-BIG-O (843-2446). Thank you for shopping with us!